The Monterey County Water Resources Agency (MCWRA) convened a panel of 10 geologists, hydrogeologists, and engineers familiar with Salinas Valley ground water basin to attempt to reach agreement on the basic physical characteristics of the basin, and the surface and ground water flow within the basin. 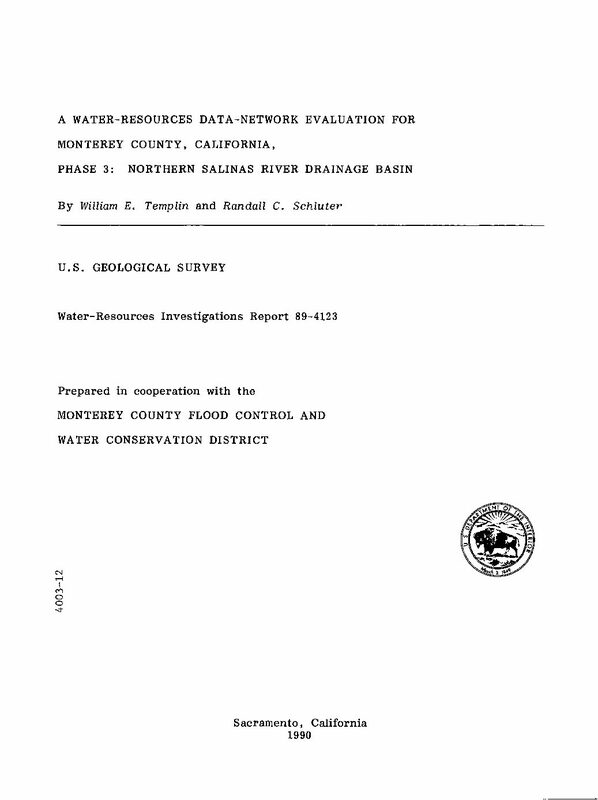 Agreement on the completeness and accuracy of existing data and previous hydrogeological studies was seen as an important first step in identifying and implementing a technically sound solution acceptable to the public that would stop seawater intrusion that began some 60 years ago. Mike Armstrong, General Manager of MCWRA, instructed the panel to review and, if possible, reach consensus on the hydrogeological characteristics of the basin, define clearly the water resources problems in the basin, and determine surface water and ground water flow within the basin. We were not requested to discuss specific local projects or political and institutional aspects of the problems. The panel met in a closed-door session in Monterey on May 24 and 25, 1995. The session was closed to the public and the press to enable the panelists to discuss and explore ideas and opinions freely without worrying about statements, questions, and hypotheses being repeated out of context. Members of the panel believe the process worked very well. This report presents our findings, conclusions, and recommendations. We were able to achieve more than our original scope of work. There was remarkable unanimity of opinion on our understanding of the physical characteristics of the basin, the hydrologic system, the interaction between surface water and ground water, and definition of the specific ground water problems in the basin. In summary, the facts we agreed upon point so compellingly toward an already identified regional solution to the Valley's ground water resources problems that the panel has included a potential solution. We have included a strong recommendation in this White Paper for implementing that regional solution. The Salinas Valley is a topographic and ground-water basin in central coastal California. The ground-water basin extends from Monterey Bay south­eastward along the Salinas River to San Arda, a distance of 70 miles, and has a maximum thickness of 2,000 feet. Annual recharge to the ground-water basin, which is derived mostly from the Salinas River, is about 290,000 acre­feet. Annual discharge, which is mostly from pumpage but also includes the consumptive use of ground water by riparian vegetation along the Salinas River, is about 507,000 acre-feet. About 45 percent of the pumpage, or 217,000 acre-feet of water annually, returns to the ground-water system. 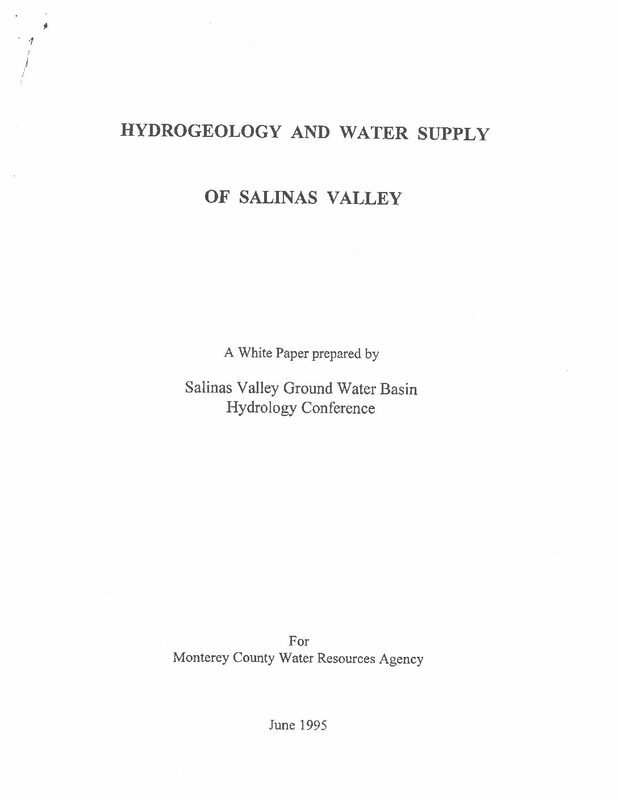 A group of interacting hydrologic models was developed for the Salinas Valley. These models include the small-stream model, river model, two­dimensional ground-water model, and three-dimensional ground-water model. The small-stream model simulates ground-water recharge from small streams that are tributary to the Salinas River. The river model simulates ground­water recharge from and surface-water discharge in the Salinas River. The two-dimensional and three-dimensional ground-water models simulate hydraulic head in the ground-water basin. The ground-water models were calibrated by comparing water level com­puted by the models to the corresponding measured water level for both steady-state and transient-state simulations. For the steady-state simulation, which was used to calibrate transmissivity for the two-dimensional model and hydraulic conductivity for the three-dimensional model, the median deviation of the model-generated water level from measured water level was 6 and 5 feet for the two-dimensional and three-dimensional models, respectively. For the transient-state simulation, which was used to calibrate storage coefficient for the two-dimensional model and specific storage for the three-dimensional model, the median deviation of the model-generated water level (at the end of a 3-year calibration period) from measured water level was 6 feet for both models.